This presentation traces a genealogy of Maya voices in Guatemalan literature through several generations of Guatemalan cultural politics and identity from the mid-20th century to the present – from the beginning stages of the country’s 36-year armed conflict to the post-Peace Accords period beginning in 1996. We initiate our analysis with a discussion of Maya and Guatemalan identity as imagined in the seminal novel Hombres de maíz (1949) by Miguel Ángel Asturias. We follow this discussion with an analysis of the imaginaries of Maya voice and identity in Luis de Lión’s novel El tiempo principia en Xilbalbá (1985). Finally, we turn to post-conflict Maya writers Rosa Chávez and Daniel Caño to explore new discourses of Maya identity in bilingual, self-translated poetry. 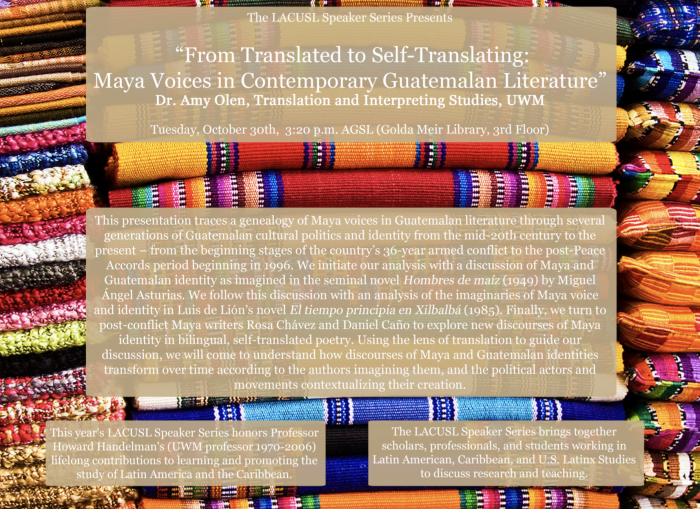 Using the lens of translation to guide our discussion, we will come to understand how discourses of Maya and Guatemalan identities transform over time according to the authors imagining them, and the political actors and movements contextualizing their creation.